Confunkshun, Rick James' Stone City Band. 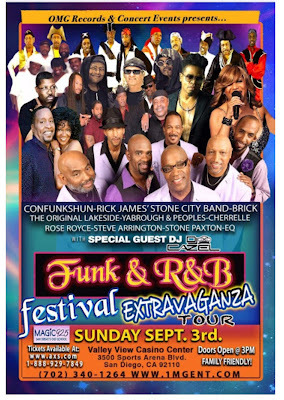 Brick, The Original Lakeside, Yarbrough & Peoples, Cherelle, Rose Royce and Special Guests just to name a few will all be in the house. This is a helluva line up and undoubtedly be a helluva concert. The concert will be at the Valley View Casino Center. Doors open at 3pm. This is a family friendly event. For more info call 702-340-1264 or go to www.1MGENT.com. Make sure you're in the house to see this. Who in this line up do you most want to see? Have you got your tickets yet?